This Ableton Live controller is now free... though you'll have to pay if you want all the goodies. 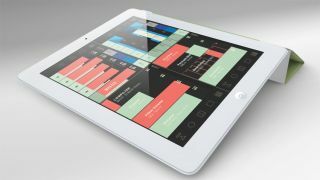 Conductr, the Ableton Live controller app from Patchworks is now available for free. With a list of Premium Modules available as in-app purchases, it's now firmly in the 'freemium' app category. The basic version gives you control over four tracks and 11 scenes on any Ableton Live set. You can also create two user modules, and each one can integrate up to eight parameters from any device on any track of your set. Following a successful relaunch, Patchworks has developed the much asked for XY-4D pad. A Conductr XY-4D pad can be created just like a user module, and can contain four FX units. Each unit allows you to control up to four parameters: one horizontally (X); one vertically (Y); one by pinching (Z); and one on/off parameter when tapping (K). So, you can control up to 16 parameters in a single module, and even have up to 64 parameters at your fingertips in the Playground with the four user modules view mode. There are currently five in-app purchase options available, ranging from £5.99 for the individual modules, £9.99 for the combined Clips and Mixer pack, and finally, £15.99 for the whole bundle. SHIFT mode to give you fast access to tracks and Master Volume and Mute. Up to 10 column view on 1/2 and full screen modes (5 column view on 4/4 screen mode). LINK function to hook up the Clips module and the Mixer module's horizontal touch scroll. High-resolution clip peak meters with ultra-low latency. SHIFT mode for fast access to each track's Pan smart crossfader and Solo and Record buttons. Create as many User Modules as you want. Four different control interfaces: faders, crossfaders, buttons and quantized scales. RESET feature: create parameter's values memories and recover them whenever you want. The Conductr free basic version will include one XY-4D FX unit. Users can purchase the Premium User Modules to get unlimited User Modules, featuring a complete XY-4D pad on each module. To find out more, head to the Conductr website for the latest news and upcoming new preset modules.